Soundmet®, the revolutionary innovation in metal jacketing acoustic insulation created by BS Stainless, is supplied with full compliance to the BS ISO 15665/2003 standard to allow our customers to buy with confidence. Introduced in 2003 as the baseline standard for the insulation of industrial pipelines, BS ISO 15665 superseded all previous specifi­cations and is now followed throughout the industry. ISO stands for International Standards Organisation, which is a united federation of standards bodies from more than 150 countries including China, Italy, France, UAE and Brazil. The non-government organisation, established in 1947, constantly updates and adds to the list of upgrades and standards as technology develops and new products and processing methods emerge. This work is extended by ISO’s working groups, which number more than 2,000 worldwide and have the objective of facilitating, improving and increasing international trade. BSI is the British Standards Institution and is the longest-running standards body in existence. The organisation was created from a meeting of several industrial institutes back in 1901 - a committee was created that had become the British Engineering Standards Association by 1929. The association, whose objectives were clearly defined by the prestigious Royal Charter, formally became BSI just a year later. BSI currently has around 20,000 separate standards and operates in more than 100 countries. BS ISO 15665 was created to assist noise control specifiers and engineers determine the correct performance classi­fica­tion and extent of acoustic insulation necessary for the successful completion of specific sound damping applications, Three separate classes - A, B and C - are used to divide acoustic insulation in terms of requirements for minimum insertion loss. Soundmet® from BS Stainless can be supplied with a range of different thicknesses of the innovative noise-damping layer, delivering effective results for all classes of acoustic insulation. Check out the graph to see the remarkable sound reduction index of Soundmet® acoustic barrier with different sound frequencies. You can purchase Soundmet® from BS Stainless with absolute confidence in its quality, knowing that you are covered by the strict specifi­cations of ISO and BS standards. 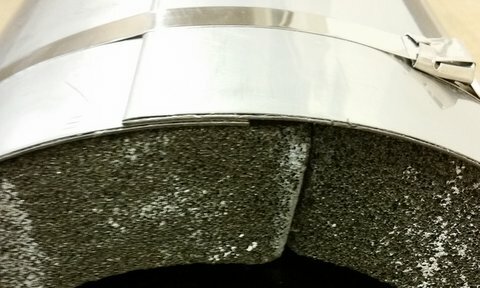 To request a sample of our game-changing acoustic insulation material, contact us today.